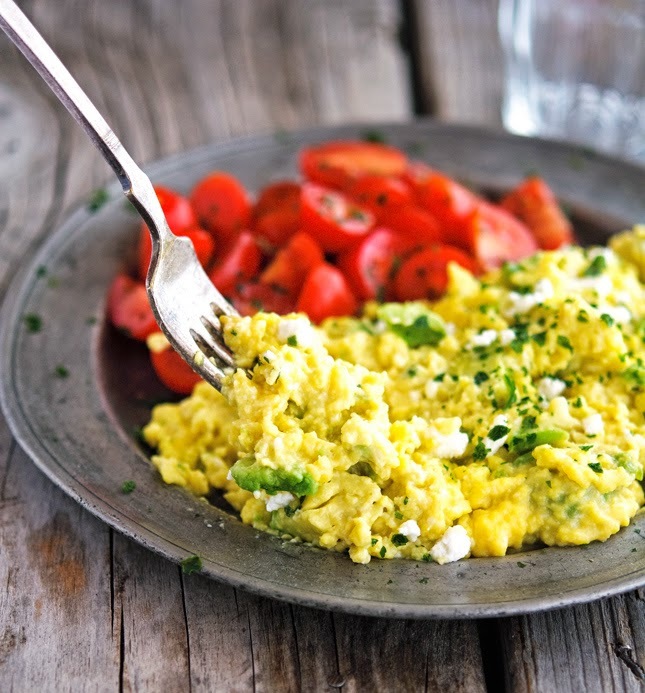 Making perfect scrambled eggs is so easy, but you’ll need a bit of patience. The secret to light and fluffy scrambled eggs is cooking them low and slow. You also need to watch them carefully and quickly remove them from the heat when they still look wet. You know what makes fluffy scrambled eggs even better? Avocado and feta. I will be the first to admit that chunks of avocado in scrambled eggs look a little odd. Try to ignore it. Soft creamy eggs cover even creamier chunks of avocado for one big creamy awesomeness. A bit of crumbled feta add that salty, tangy flavor that counterbalances the slight sweetness just perfectly. These scrambled eggs are so delicious, you’re going to make ‘em again and again and probably again. Trust. 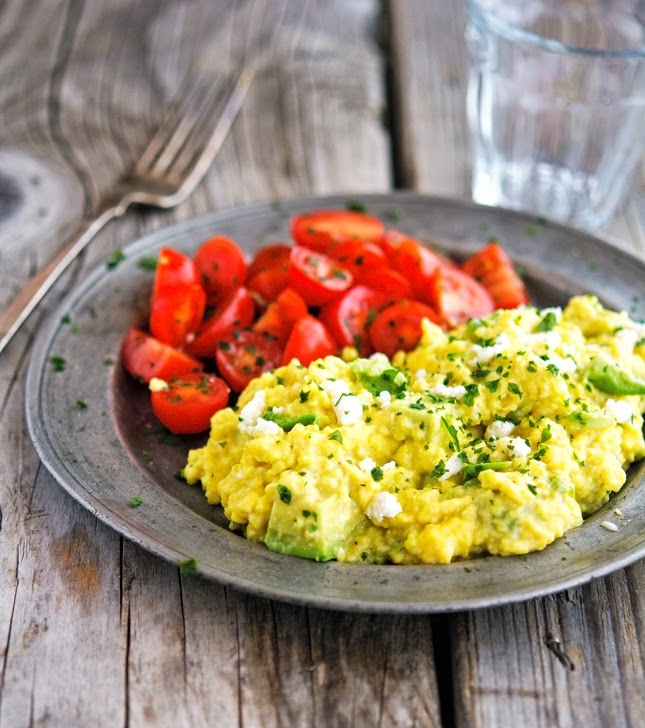 Fluffy Scrambled Eggs with Avocado and Feta Print this recipe! Crack the eggs into a cold 3-quart saucepan. Cut the butter into small pieces and add to the pan. Set the pan over medium-low heat and, using a wooden spoon (or a heatproof spatula) mix the eggs to break them up. Stir constantly, moving the pan off and on the heat so you can stir the eggs if they are cooking too quickly in one spot. After about 5 minutes small curds with a pudding-like texture will begin to form. Keep the curds moving. Once you've got a saucepan full of small, even but still-wet curds quickly remove the saucepan from the heat. The eggs will continue to cook with residual heat which can dry them out. Take them off the heat when they still look wet, but not runny. Add the salt and diced avocado. Top with crumbled feta, some chopped herbs, and a few grinds of black pepper. One serving yields 377 calories, 32 grams of fat, 10 grams of carbs, and 16 grams of protein. Hi Mike, I love scrambled eggs that are slow cooked, love the toppings you added too! Yum. And, the buffalo style pork chops were amazing by the way!! I saw the picture on IG, I'm so glad you guys liked it! A simple and incredible recipe. Great job Mike! Low and slow is definitely the way to go for scrambled eggs. Great post! Low and slow, that's the only way to make scrambled eggs! I agree about low and slow. I live creamy scrambled eggs. Will have to try this recipe. I usually eat mine plain with a little salt and pepper. Sometimes with some cheese. Avocados + Feta = one of my favorite flavor combos! Avocado and feta is a marriage made in heaven! Also, if I wanted to make this with only 2 eggs (with yolk) and rest egg whites...how much egg whites would you suggest? Want to lower the cholesterol. I've always struggled with these! They turn out more like a sectional pancake - which everyone minds but me :P Apparently that is due to my non-stirring! Can't wait to re-try. The stirring is crucial Jill, there's no way around it! Excellent flavor combo here and I think with the addition of some fresh tarragon I have this will be breakfast tomorrow! Thanks Mike. Looks beautiful. Adding tarragon is a great idea Kev, I'm going to try it next time! I love having tomatoes on the side, not in the eggs. Is that weird? Hope your week is off to a wonderful start, my friend! I went through the egg whites phase as well a couple of years ago, now I'm all for eating whole eggs. They taste soooo much better! Wow! These instructions for scrambling eggs are totally different from what I learned a few million years ago. But then again, I probably make what you would consider dry eggs. On those rare occasions when I make them. However, when you add two of my favorite things to the eggs, I might decide I like eggs better. I will be trying this, and hoping that my husband doesn't complain about the avocado (he doesn't like them, but did survive having avocado in a smoothie recently). Well, if he doesn't like avocado just make some for him without it. I say a man has the right to eat his scrambled eggs as he likes it. Am I right? Yum!!! Lately I've been cooking my eggs with coconut oil and love it!!! I'll have to spice it up with some parsley! I like making scrambled eggs with coconut oil, but I LOVE making them with butter. They complement each other soooo well! Perfect scrambled eggs can sometimes be so hard to achieve so props to you Mike for making these so fluffy and perfect! I need to try out your recipe and technique.. So that's lunch sorted for tomorrow. Love it. Low heat is KEY for many fragile things- That's what I found works for pancakes! Absolutely man, making pancakes over low heat makes a whole lot of difference! 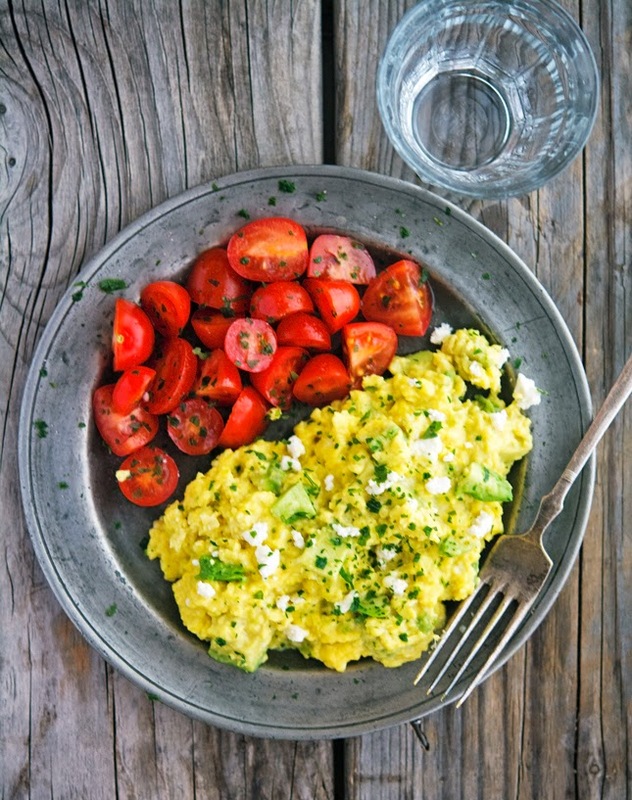 I totally agree, scrambled eggs are so perfect for a kid to whip up too. These look so fluffy and adding avocado and feta is awesome. My boys love making their own scramble, will show it to them. Great one. You are so right! I have been trying to perfect my scrambled eggs for YEARS. They are either too runny.. to dry, but thanks to you I think I have found the solution! Can't wait to try! Yum!! Yeah this just looks all kinds of yummy in my tummy. I need the patience for scrambled eggs, I think I use to have it but then a 2 year tugging at my leg asking for his eggs just makes me crack that burner up. Loving the feta and fresh herbs in this Mike. De-lish! Wow, this is brilliant!. Simple yet looks so flavorful. I'm going to try this tonight! Love your recipes! Creamy scrambled eggs are the best breakfast, especially with black coffee! It is weird how almost every breakfast restaurant you go to produces the same rubbery scrambled eggs - maybe it's better if you live in a city with more options but I'd rather stay home on the weekend and try your recipe cause these look amazing! I just tried making the eggs. I didn't have avocado or feta , so I used tomato & cheese. That's fantastic Sam, I'm so glad you enjoyed this cooking technique!